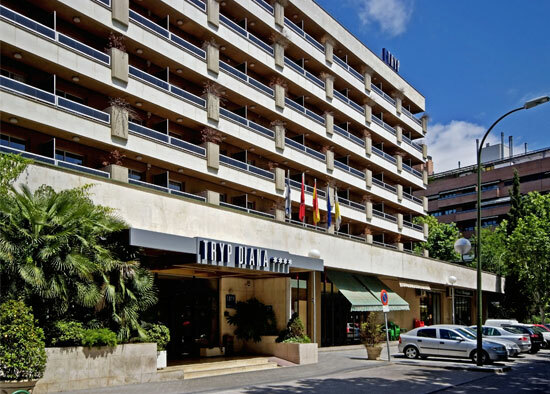 Tryp Diana is a four stars hotel located near the Barajas Airport, Madrid. Our experience with Tryp Diana Hotel was kind of limited: check in, shower, sleep, check-out. Our plane landed on Barajas Airport late at night(about 1.30 a.m.) and that’s why we decided to spent that night at a hotel near the airport. We’ve checked out at 10.00 a.m.
We booked with TripAdvisor.com only two days before our trip and we payed about 45Euros for a double room for one night. My rate for Tryp Diana is 4 out of 5. The minibar was empty. So if you wake up in the middle of the night and you’re thirsty, don’t panic, there are some vending machines in the hotel lobby, next to the reception. The rooms need some uplifting(at least the room we stayed in). One thing is for sure: this hotel definitely is not a four stars hotel. Maybe it could have passed as a four stars hotel in the 80’s . But today, the correct qualification has to be a decent three stars. In conclusion, if you stuck in Barajas between flights, you missed your connecting flight or your flight got cancelled and you need a reasonable priced hotel to spend the night, Tryp Diana is the best choice. For more reviews on Tryp Diana Hotel in Madrid check TripAdvisor.com. This entry was posted in Accomodation Reviews, Spain and tagged hotels, madrid. Bookmark the permalink.